Forget about the automobile industry turning over a new leaf for the new year: the beginning of 2019 has started just as miserably as 2018 ended for many major auto OEMs in the US. 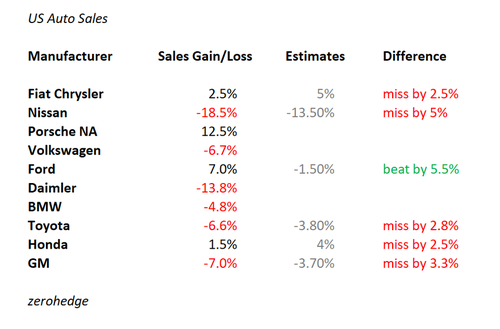 On Friday, January sales numbers for most automakers trickled in, with almost all manufacturers posting disappointing results and/or missing estimates. Ford – which no longer reports official monthly sales numbers, just like GM – was the one exception, rising 7% versus estimates of -1.5%, according to Bloomberg who cited “people familiar”. GM, on the other hand, fell 7% versus estimates of -3.7%.” Japanese car giants Nissan and Toyota also both posted losses that were larger than expected and companies like Fiat Chrysler and Honda saw their meek gains falling below expectations. As was expected – and stop us if you’ve heard this one before – most companies wound up blaming the cold weather. Honda got creative and also blamed the government shutdown. The results also indicate that the annualized industry sales rate has slowed more than estimated. Analysts were previously projecting 16.9 million cars and light truck deliveries for the month compared with the 17.1 million that were delivered in January 2018. Most companies have directly or indirectly conceded that demand is going to slow in 2019 with interest rates higher than they’ve been in a decade. The average rate on new cars moved up to 6.2% last month from 5% a year ago. The Jeep brand, which had been carrying Fiat Chrysler for the past 12 months, had its first monthly drop since December 2017. And by “saved the day”, she means that Fiat’s numbers came in well short of expectations. To add insult to injury, Fiat Chrysler also posted these poor numbers despite the fact that they sold 50% more vehicles to fleet customers during the month. Fleet channels are generally used to make sales look “robust” during weak periods. This January, Fiat delivered about 23% of their vehicles to fleets, versus 16% a year ago. Finally, Nissan saw a 40% plunge in sales of its Altima sedan. It looks as though the bottom of the plunge for sedans – a result of the popularity of SUVs – isn’t quite in just yet. We wonder what the excuse will be when it starts to warm up this spring – global warming? Did THE MOST POPULAR ‘Alt-Media’ Financial Website SELL-OUT To The Trump 2020 Re-election Campaign?